Connecticut’s neighborhood bar & restaurant since 1898. Check out our menus by location or order your food online. It’s that time of year. Again. Give the gift of good times with an Archie’s gift card. 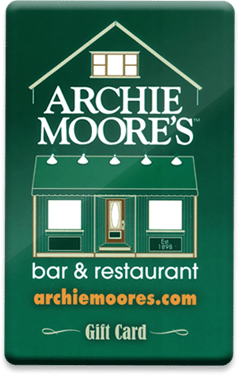 Contact us to book your holiday gatherings at your neighborhood Archie Moore’s today! © 2018 Archie Moore's Bar & Restaurant. All Rights Reserved.